Will you become my host family? We travel to explore the world, we learn new languages because they fascinate us, because we feel drawn to a certain culture or simply to get to know the locals when we’re on vacation. We don’t always have to look far for these new and interesting experiences. Sometimes, they find us! 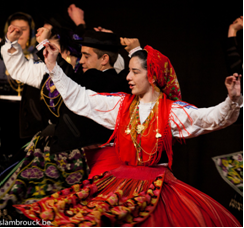 Every year, around Easter, the festival “Leuvense Paasfeesten” receives folk groups from all over Europe. We have had guests from the Netherlands, Germany and Austria. But also from warmer regions such as Spain and Portugal or farther away, like Poland or Latvia and many more. We want these dancers and musicians to feel at home in our city. And what better way is there than to do this by placing them in a warm host family? Being a host family means grabbing a unique chance to get up close with a different culture. If you choose to be a host family, you will welcome dancers or musicians into your home. They will be at least 16 years old and you can tell us your preference for men, women or couples. We will try our best to take this into account when assigning guests. As a host family, you will provide lodging for at least 2 people for 4 to 5 nights. You will also provide meals - mainly breakfast - and a bath and/or shower. Your guests will arrive on Thursday before Easter (April 18, 2019) and will leave on Monday evening (April 22) or Tuesday morning (April 23) the week after that. You will honor the festival program and take care of your guests' transportation to and from the festival. Being a host family during the “Leuvense Paasfeesten” means 5 days of fun, getting to know different cultures, spending time with your guests, funny linguistic situations, free entrance to all activities for the entire family and a free meal to thank you for your hospitality.